CarGurus has 5,104 nationwide MKX listings starting at $2,900. Thanks to torque, the turbocharged Lincoln MKX is responsive and quick, especially when the 6-speed automatic transmission is in Sport mode. Without a talented chef, the best ingredients from around the world can produce a mediocre meal. Thus, the redesigned 2016 Lincoln MKX comes across as half-baked, a stylish and remarkably well-equipped vehicle that is good rather than great. To better compete in an increasingly crowded segment, this Lincoln requires additional refinement and attention to detail. Styling will be responsible for selling the 2016 Lincoln MKX, a midsize, 5-passenger, luxury crossover SUV that directly competes with the Lexus RX, the best-selling model in the segment and one of the best-selling luxury-brand vehicles in America. Have you seen the new Lexus RX? Its wild design represents a gift-wrapped opportunity for Lincoln, and in my opinion, especially when equipped like my test vehicle, the 2016 MKX is far better looking than the 2016 RX. But is there substance behind the Lincoln’s good looks? Based on a week spent driving my loaded MKX test vehicle, the answer is yes. And no. Lincoln gets the exterior styling right, but flubs the MKX’s interior, which doesn’t look or feel like a substantial upgrade from the Ford Edge upon which it is based. Especially in terms of touch points, from the oversize, cheap plastic keyless entry fob to steering-wheel stalks that belong in a Ford Fiesta and not a mega-buck luxury SUV, the MKX’s cabin disappoints on several fronts. Plus, my test vehicle displayed two significant build quality issues that call into question the sanity of paying more than $63,000 for a Lincoln. That’s right. My test vehicle cost $63,390. How could that happen? Well, you start with a base MKX, which is priced at $39,185. Now add the Reserve equipment package, a turbocharged 2.7-liter V6 engine, and all-wheel drive (AWD), bringing the tally to $50,735. To this, my test vehicle added nearly every available option. After adding Cargo, Trailering, Climate, Technology, Driver Assistance, and Luxury option packages, plus 21-inch aluminum wheels, 22-way power heated and ventilated front seats with massage, and a handful of additional upgrades, the price rose to $63,390 including the $895 destination charge. 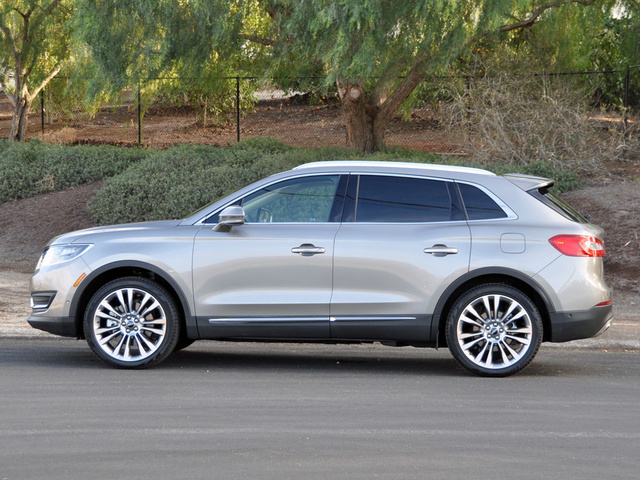 The result is a Luxe Metallic Lincoln MKX that looks terrific and completely different from the Ford Edge with which it shares a platform and structure. Inside, where owners spend all their time, the MKX is not quite as convincing, especially at my test vehicle’s fully loaded price point. Opt for the turbocharged 2.7-liter V6 engine, and performance is not a problem. Generating 335 hp at 5,500 rpm, the EcoBoost engine upgrade doesn’t provide a big increase over the MKX’s standard 3.7-liter V6. Torque is the reason to drop $2,000 on this engine, to the tune of 380 lb-ft of the stuff at 3,000 rpm. Thanks to torque, the turbocharged Lincoln MKX is responsive and quick, especially when the 6-speed automatic transmission is in Sport mode. The optional AWD system ($2,495) and massive 21-inch wheels and tires ($1,165) help to get the power to the pavement, and during my testing I averaged 18.5 mpg, not far short of the EPA’s official fuel-economy rating of 19 mpg in combined driving. 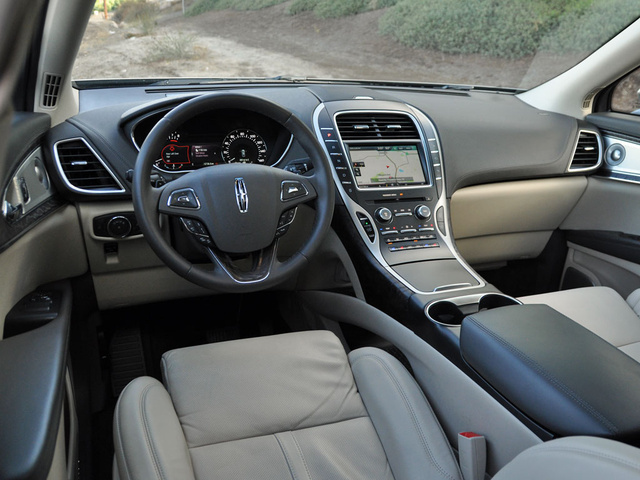 Lincoln Drive Control allows the owner to program the MKX’s driving dynamics to Comfort, Normal, and Sport settings. For everyday driving, I preferred Comfort mode, mainly because the 21-inch wheels delivered too much impact harshness, and the softest suspension setting did the best job of absorbing it, even if it allowed excessive body motion and wallow. Sport mode quickened powertrain response and stiffened the steering and suspension, lending the MKX a tauter, more athletic driving dynamic. No matter which setting you choose, the MKX is not as confidence inspiring to drive with enthusiasm as some of its competitors, but it does match vehicles like the Cadillac SRX and Lexus RX in terms of driving dynamics. Plus, the brakes work flawlessly, and they offer an Auto Hold feature so the driver doesn’t need to keep pressing on the brake pedal when stopped in traffic or at an intersection. Lincoln needs to refine the MKX, from improving the sound and feel of the doors when opening and closing them to resolving potential build-quality problems. My test vehicle’s headliner was coming loose above the left rear door, and the seat padding and upholstery were coming apart under the driver’s seat thigh-support bolster. While my MKX’s interior boasted matte-finish wood trim, Bridge of Weir Deepsoft leather seating, ambient cabin lighting, and soft material just about everywhere occupants might touch the cabin, the instrumentation, switchgear, plastic trim panels, and infotainment system lent the Lincoln a low-rent appearance. These aspects of the MKX, more than anything, are likely to restrict the SUV’s success. 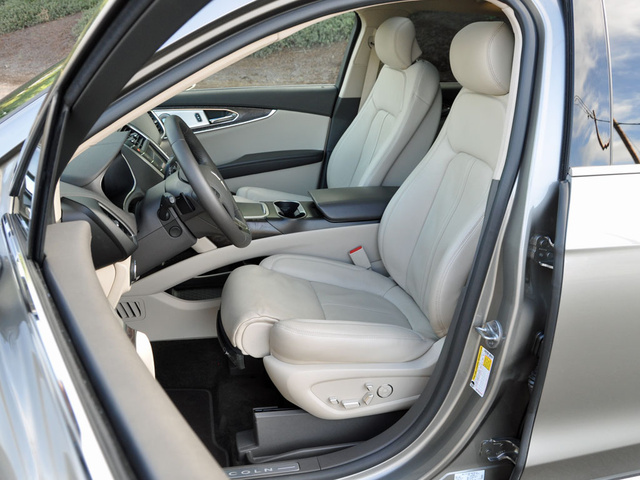 Comfort is not a problem, especially when equipped with the optional 22-way power-adjustable front seats ($1,500). They include heating, ventilation, and massage functions, and once you’ve got the 22 different adjustments set to your comfort, the MKX is one soothing SUV. My test vehicle’s rear seats were heated, too, and provided plenty of legroom and space for feet. The bottom cushion is supportive and sits high off the floor, and the seatbacks recline a bit for extra comfort. 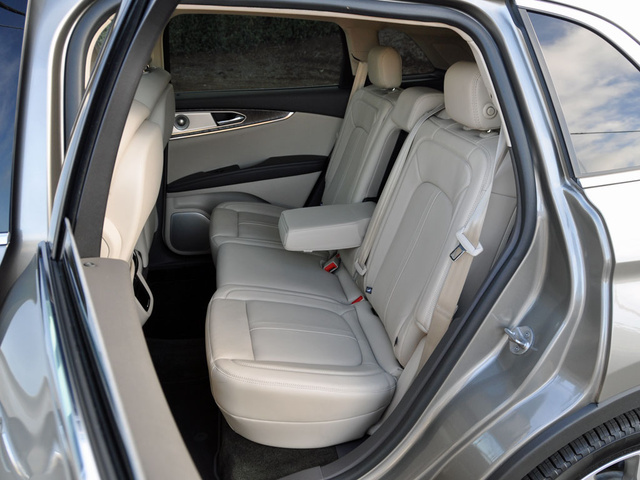 Behind the rear seat, the MKX supplies 37.2 cubic feet of space. My test vehicle’s power folding rear seats expanded cargo volume to 68.8 cubes. My test vehicle had a hands-free liftgate for accessing the cargo area when your hands are full, but I couldn’t get it to work. Up front, storage space is generous, though it’s not obvious. Aside from missing an opportunity to include a bin in the door armrests, Lincoln has carved out lots room to stash stuff. Unfortunately, much of it is difficult to access in trays embedded beneath the center console that are hard to see and to reach. Blessedly free of the touch-sensing control panels that Lincoln has used in recent years, the MKX’s control layout is relatively simple and straightforward. Except for the infotainment system, knobs and buttons are the rule, and a driver information system allows for custom configuration of a wide range of vehicle functions. 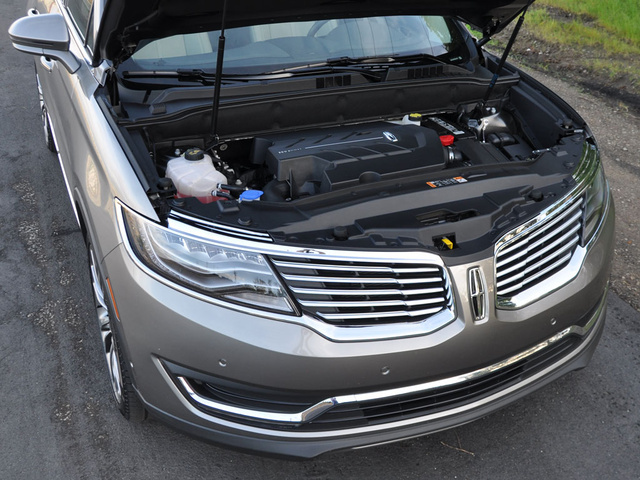 I would, however, suggest that Lincoln widen the panel containing the stereo and climate controls, in the process relocating the buttons for engine Start/Stop, the glove box, and the Auto Hold braking function. With a wider panel, knobs could be added for temperature control, and buttons could be larger with bigger markings. My test vehicle had a MyLincoln Touch infotainment system. As 2015 draws to a close, the Lincoln website says that the 2016 MKX comes with Sync 3 technology, which is the company’s new-and-improved infotainment system with faster response time, improved voice-recognition technology, better graphics, and a touchscreen that works similarly to that of a smartphone. What gives? The answer could be that my MKX was a pre-production vehicle never intended for sale to the general public. Sometimes such early production vehicles are used for media evaluation, and that would certainly explain the shoddy build quality exhibited by my test vehicle. Alternatively, the answer could be that Sync 3 represents a running change for the MKX. This means that the new infotainment system wasn’t quite ready when the rest of the new MKX was, so Lincoln began production and then switched over to Sync 3 at the first available opportunity. Thus, early-build versions of the SUV would have the old MyLincoln Touch infotainment system. Whatever the explanation, if you decide to buy a Lincoln MKX, get one that has Sync 3. MyLincoln Touch is comparatively outdated, slow to respond to inputs, and aggravatingly difficult to use while driving. With the debut of the new MKX, Lincoln has announced a partnership with Revel Audio, and the company offers two premium sound systems for this SUV. My test vehicle had the most expensive one, packaged with adaptive LED headlights in a Luxury Package ($4,400). It provides 19 speakers arrayed throughout the cabin and is engineered to provide a concert-style listening experience. Now, I’m not an audiophile, and maybe the trouble was related to age, hearing loss, or the kind of music I prefer (alternative rock), but when this system’s Onstage and Audience settings were active, I thought the sound quality was awful. Thus, I turned the fancy settings off and wondered why anyone would pay thousands of dollars for the Revel Ultima upgrade. A rear-seat entertainment system is available for the MKX, equipped with viewing screens that are embedded into the front-seat head restraints. My test vehicle did not have this option, but it did include a terrific 360-degree, top-down camera view of the MKX and its surroundings. Plus, it had Enhanced Active Park Assist, which steers the SUV into a parallel or perpendicular parking space while the driver operates the transmission and brake pedal. The “enhanced” part of that equation pertains to the Park Out Assist function, which can extract the MKX from a particularly tight parking situation without damaging the vehicle parked in front and in back of the Lincoln. If so many aspects of the new MKX come across as half-baked, rest assured that this Lincoln has the power to protect you and your loved ones. From its MyKey programmable vehicle settings that are designed to encourage safe driving in teenagers and its subscription-free 911 Assist service to a full suite of driver-assistance and crash-avoidance technologies, the MKX gets safety right. A blind-spot warning system with rear cross-traffic alert is included with the Reserve equipment package, a safety feature that will absolutely be installed on my own family’s next new vehicle. In addition to this, an affordable Driver Assistance Package ($1,650) equips the MKX with adaptive cruise control, forward collision warning with pedestrian detection, brake support and automatic emergency braking, lane-departure warning and lane-keeping assist, and driver alert monitoring systems. Additionally, a set of inflatable rear seat belts is available, supplying extra cushioning if a collision does occur. Perhaps the best thing about the MKX’s suite of safety systems is that the driver can turn them on or off, and program both sensitivity and warnings so that they work in subtle rather than blaring fashion. The result is an active safety net working in the background without unnecessarily startling a driver. In crash tests conducted by the federal government, the Lincoln MKX earns 5-star ratings in each assessment, combined with a 4-star rollover resistance rating. As this review is written, Insurance Institute for Highway Safety (IIHS) testing is incomplete. The MKX receives Good ratings for moderate offset frontal impact and side impact tests, but the IIHS has yet to determine small overlap frontal impact and roof crush strength test results. There are three ways to measure the Lincoln MKX’s cost effectiveness. First, you can compare it to the Ford Edge upon which it is based or loaded examples of other mainstream crossover SUVs like the excellent Kia Sorento SX Limited. In these types of comparisons, the Lincoln’s value equation is dubious at best. Second, you can compare it to the BMW X5 and Mercedes-Benz GLE-Class, German-engineered SUVs that cost more — and for good reason. In these types of comparisons, the Lincoln’s value equation is clear, especially if the buyer sets a low bar for quality, refinement, and sophistication. Third, you can compare it to the Lexus RX. Personally, I think Lexus designers need to check into rehab, and in comparison to the RX, the MKX is as hot as Miss Philippines (or Miss Columbia). But aside from its science-fiction styling, the RX is likely to excel in terms of quality, reliability, refinement, and the costs associated with ownership, areas where the Lincoln may struggle. Taken individually, from its robust new platform and powerful turbocharged V6 engine to the Lincoln-exclusive design, features, and materials, the components used to create the MKX should have produced a vehicle that looks and feels undeniably different from the Ford Edge upon which it is based. Lincoln clearly possesses the foundational ingredients to build an MKX that is competitive with other luxury crossover SUVs. 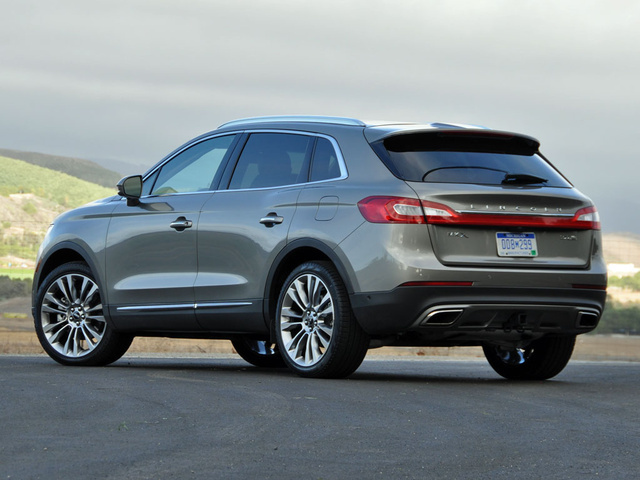 Unfortunately, the 2016 Lincoln MKX comes across as less than the sum of its parts. This SUV lacks the sense of luxury, refinement, and sophistication necessary to put proper distance between it and the Ford Edge, let alone to match the segment leaders in terms of substance. Don’t get me wrong: I like the Lincoln MKX. I think it's one of the best-looking luxury crossover SUVs you can buy, especially with the attractive 21-inch wheels, and its turbocharged 2.7-liter V6 impresses. But until it benefits from greater attention to detail inside the cabin, where owners will spend all their time, I can’t recommend it as a credible alternative to the leaders in the segment. 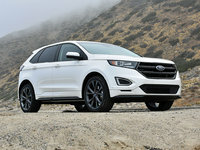 In the meantime, sign me up for a loaded Ford Edge Sport. 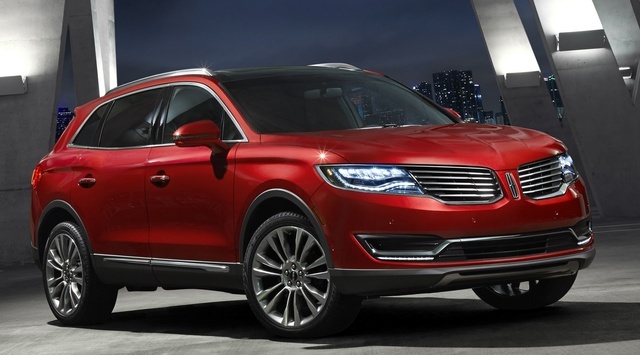 What's your take on the 2016 Lincoln MKX? dogmomma We took possession of our 2016 MKX in early May. Our previous car was a 2008 Lexus RX350. I think you should drive a car for a day or two before you buy it. Our MKX has the turbo engine. We love this but there are other aspects of this vehicle I don't like at all. First, it picks through the gears. When going throught 25 MPH and 40 MPH areas you can't drive like you're on the freeway. This car shifts and down shifts repeatedly. Secondly, it sounds like an older Civic. It's got the brrrrrrr sound when you drive it. I'm embarrassed frankly. When a vehicle is advertised as heavily as the MKX is there is a reason. You don't see that being done with the Acura MDX or others in that class. The radio is ok, bought the 13 speaker model. Not stellar though and not sure it's worth what we paid. Time will tell and we can always get rid of it and go to something else. Rats!! BWISE_123 I AGREE, YOU SHOULD ALWAYS TEST DRIVE A CAR AT LEAST TWO DAYS BEFORE YOU SIGN ON THAT DOTTED LINE AND GIVE YOUR HARD EARNED MONEY FOR SOMETHING YOU WILL LATER REGRET. TEST DRIVE FOR COMFORT, SOUND, QUESTIONS...."JUST TEST DRIVE" AND IF YOU FIND IT WORTH YOUR MONEY, BUY IT,IF NOT, MOVE ON!!!! TheHorror Why don't you just give me all the money you obviously don't value, dogmomma? Users ranked 2016 Lincoln MKX against other cars which they drove/owned. Each ranking was based on 9 categories. Here is the summary of top rankings. 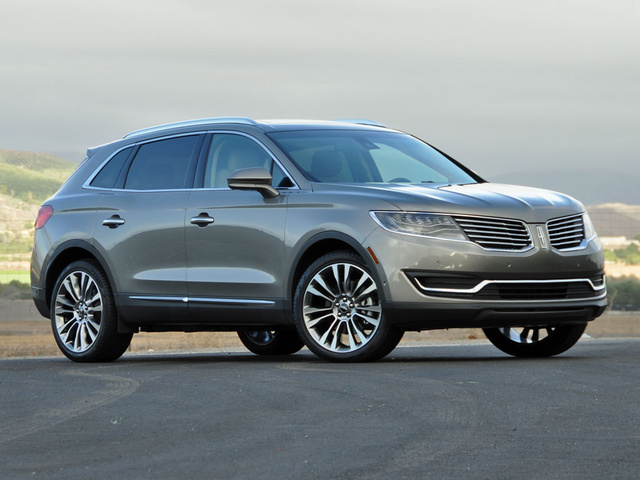 Have you driven a 2016 Lincoln MKX? My2016 Lincoln LKX with the large V6 engine has stopped twice and this message was in the dash speedometer area.